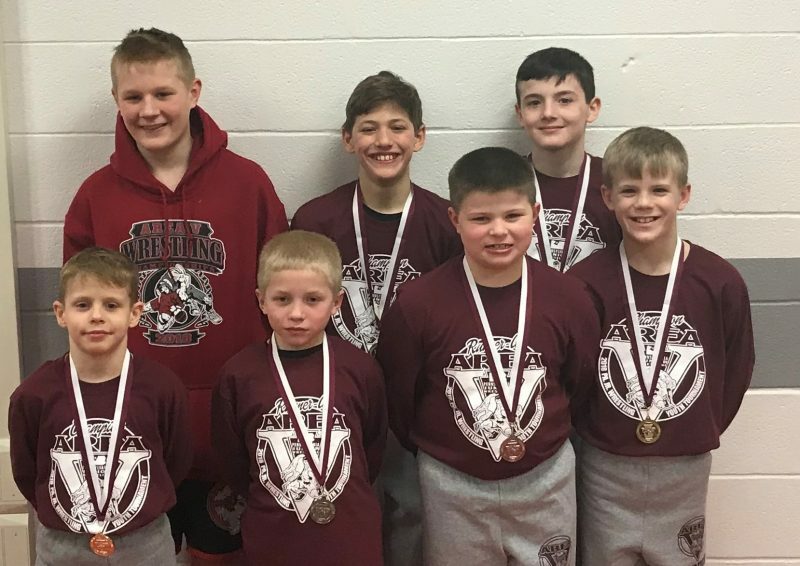 CLEARFIELD — The Pennsylvania Junior Wrestling Area V Youth Tournament was held at Clearfield High School this past weekend. Clearfield had seven wrestlers qualify for the state tournament which will be held this Friday and Saturday at the Mohegan Sun Arena in Wilkes-Barre. Front, Lt. to Rt. : Matthew Rowles (1st 8U 50lbs), Bo Aveni (2nd 8U 55lbs), Brayden Wills (2nd 8U 110lbs), Cash Diehl (1st 9&10 70lbs). Back, Lt. to Rt. : Carter Chamberlain (2nd 11&12 145lbs), Will Domico (1st 11&12 90lbs), Brady Collins (1st 9&10 85lbs).